Flags & Bunting. 10m Red White and Blue Bunting. 10m / 20 FLAGS COLOUR BUNTING FLAGS PENNANTS PARTY DECORATIONS PARTIES FLAG. 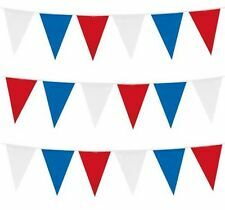 10m / 33FT LARGE COLOUR BUNTING FLAGS PENNANTS PARTY DECORATIONS PARTIES. BLUE & YELLOW YORKSHIRE BUNTING FLAGS 10M LONG, 30CM x 20CM TOUR DE YORKSHIRE. 6m of bright and cheerful honeycomb tissue garland with a rounded scalloped pattern We have a great selection of celebration party decorations and tableware. We will always help you to have a 100% positive happy buying experience. 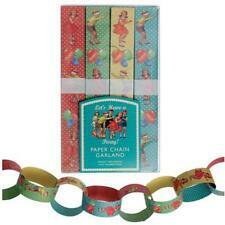 Gorgeous Set of 4 Hip Hip Hooray Party Paper Chains - Perfect Venue/Party/decoration. If you do not specify a preference where there is more than one colour choice as an option, then any colour will be allocated and dispatched to you. Cute 6m paper garland of baby feet in different shades of pink. Garland depth is 15cm. We have many different designs of bunting; banners; garlands and hanging decorations. We will always help you to have a 100% positive happy buying experience. Cute 6m paper garland of baby feet in different shades of blue. Garland depth is 15cm We have many different designs of bunting; banners; garlands and hanging decorations. We will always help you to have a 100% positive happy buying experience. (Honeycomb Garland Aituka 6m. Multi- coloured paper garland - perfect for party decorations, festivals or Christmas. - all coming back into fashion!). Should you have a problem with any of our products, we are always here to sort things out quickly and painlessly! 6m of bright and cheerful honeycomb garland with linked frilled circles We have a great selection of celebration party decorations and tableware. We will always help you to have a 100% positive happy buying experience. (Honeycomb Garland Pukapuka 6m. Multi- coloured paper garland - perfect for party decorations, festivals or Christmas. - all coming back into fashion!). Should you have a problem with any of our products, we are always here to sort things out quickly and painlessly! 6m of bright and cheerful honeycomb garland creating lacy oval shapes with flowery centres. We have a great selection of celebration party decorations and tableware. We will always help you to have a 100% positive happy buying experience. Pink Baby Feet Banner. Should you have a problem with any of our products, we are always here to sort things out quickly and painlessly! 6m of bright and cheerful honeycomb garland creating intricate lacy square patterns. We have a great selection of celebration party decorations and tableware. We will always help you to have a 100% positive happy buying experience. Material: Crepe Paper. Length: 30 ft (9.14 m). Honeycomb Garlands Multi Coloured Nassau. Multi- coloured paper garlands - perfect for party decorations, festivals or Christmas. Should you have a problem with any of our products, we are always here to sort things out quickly and painlessly! 6m Colour Pink Feet Design Party Accessory Lovely Design . 6m Aituka Theme Quantity 1 Honeycomb Style Party Accessory . 6m Colour Blue Feet Design Party Accessory Lovely Design . 6m Pukapuka Theme Quantity 1 Honeycomb Style Party Accessory . 6m Manhiki Theme Quantity 1 Honeycomb Style Party Accessory . 6m Nassau Theme Quantity 1 Honeycomb Style Party Accessory . Excellent service, punctuality and reliability always in the foreground is for us. Material PVC. Länge 6-10 m. Painting by Numbers. Carnival & theatrical makeup. Includes polka dot, stripes, Hip Hip Hooray and Party! work place. A fun way to decorate for a party. Set of 200 paper chains. We endeavour to answer your queries within 48 working hours. Wherever possible we do try & re-use all our cardboard boxes.